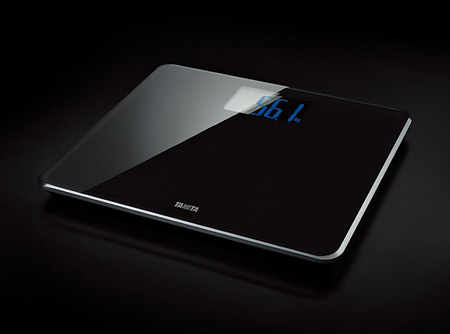 The concept behind the HD-366 digital bathroom scale is to make it look like a subtle, plate-like object that is congruous with its surrounding. The body is a uniform black surface until the user steps on it and activates the display making the blue backlit text appear. The first prototype glass bathroom scales appeared in Europe in 1992. It gained prominence in Europe around 1995 and later it became a successful product in America. Despite its success in Europe and America and the wide variety of models that were created, glass scale never gained a wide popularity in Japan. Considering these circumstances, HD-366 makes the best use of the glass material. Taking into an account that Japanese men and women are becoming more obese due to the prevalence of "metabolic syndrome" it provides a larger surface and is capable of taking weight measurements up to 200kg. Additional design elements such as rounded edges, the right step-on height and the contrast between the blue backlit LED and the body color make it more appealing. This scale is an engaging concept and I have a feeling that it will evoke a new wave of enthusiasm for glass scales.